Westerfeld, S. (2009). Leviathan. Chicago, IL: Simon Pulse. Alternate history in a steampunk version of WWI. 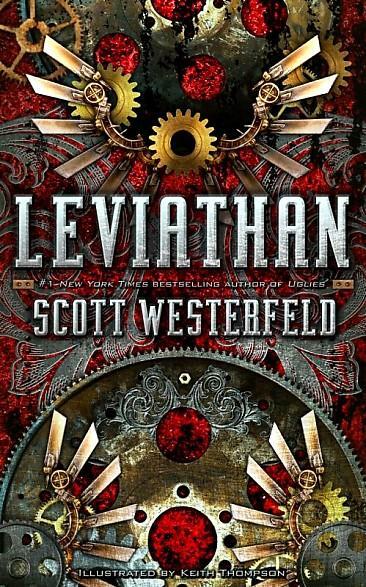 Leviathan is filled with tons of steampunk inventions, battles, suspense, double identities, and adventure. In this alternate 1914, the Great War (WWI) is about to break out between biotechnologically based Darwinist nations and the traditional mechanical steam based Clanker nations. A war based off of nature vs. machines. Dylan aka Deryn Sharp (Darwinist), a girl that dreams of flying, poses as a boy so she can get into the British Air Service meets Alek aka Aleksandar Ferdinand (Clanker), prince of the Austro-Hungarian Empire, disguising himself as a commoner to hide from his enemies that have already assassinated his father Archduke Franz Ferdinand. Deryn and Alek meet when the living flying whale ship the Leviathan crash lands near the Swiss Alps (neutral Ottoman Empire) and the two must learn to put aside their notions of friend and foe so to cooperate and use their ingenuity and diplomacy to repair the Leviathan to escape destruction by the Clankers. Westerfeld has created a unique and fascinating technological world with elaborate machines and bizzare genetically engineered animals. Clanker machines include the combat Stormwalker gunners, Zeppelins that serve for air travel for combat or just transport, and the land ship the Dreadnaught. Darwinist creations include the Leviathan, an air-whale that is an entire living combat ecosystem. The Minotaur is another airship similar in design to the Leviathan. Scout machines engineered from giant jellyfish, message relaying lizards, hawks with acidic spider webs on their wings so as to slice through metal, bats crossed with moths and mosquitos so as to produce and fire metal spikes, dogs engineered to sniff out hydrogen leaks on ships, and the ocean battling sea creature, the Kraken. Keith Tompson’s illustrations are fantastic and almost a necessity. Though Westerfeld does details the machines and beasts, Tompson’s sketches enhance the reader’s experience. Westerfeld also includes a brief section at the back of the book about what details he changed regarding WWI and what actually happened. Leviathan most likely will appeal to fans of Mortal Engines by Philip Reeves, Airborn by Kenneth Oppel, and Hayao Miyazaki’s manga series Nausicaä of the Valley of the Wind. "The more that you read, the more things you will know. The more that you learn, the more places you'll go."